Well, we did it! We went through one entire day, from sun-up to sun-down, without using social media. I hope that you found it to be as uplifting as I did. It is not easy, but spending that extra time with God made it worth it. I would love to hear about your experiences yesterday-please leave a comment below letting me know how yesterday went for you! For today’s challenge, in addition to continuing without social media from sun-up to sundown, I would like for us all to memorize a piece of scripture that means so much to me when I feel tempted to give in and waste my precious, God-given time. Abundant is defined as “present in great quantity, more than adequate, over-sufficient, well supplied, abounding, or richly supplied.” I don’t know about you, but that is the kind of life I want! I don’t want to be satisfied with an adequate or sufficient life, I want an abundant life! …and God wants that for us, too. 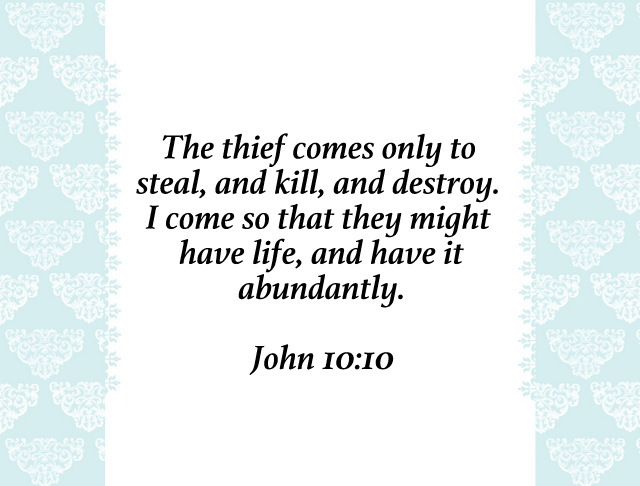 All we have to do, guys, is stop giving in to the thief that is coming to destroy that abundant life. Challenge #2 I challenge you to memorize John 10:10 today. Write it down on post-its and put them around the house in places that catch your eye. Be sure to put one of those post-its on your computer. When you are tempted to quickly check Facebook or Twitter or Instagram, say this verse to yourself and imagine what God wants for you. Have a great, abundant day! I have to admit today was easy because I had a long to do list. Lazy Sunday afternoon will be harder. I agree! Tomorrow will be tough. I have thought of doing that, myself. I imagine that it does take some pressure off!